Ceiling Tiles, Wall Panels and Cornices are manufactured from Tin-plated steel with a thickness of 0,10 and perfectly suited for use in both Commercial & Residential Applications. Tin Plated Steel Wall Panels & Ceiling Tiles are being used for Drop In Suspended Grid Ceiling Systems, as well as being installed with hammer & nails. Tin Plated Steel Ceiling Tiles and Wall Panels are used in Restaurants, Night Clubs, Retail Stores, Churches as well as on Movie Sets. Our Tin Plated Steel Ceiling Tiles in “Coyote Ugly” and “Spiderman”. More recently in “Jonah Hex” and the more recent “True Grit”. Many TV Shows use also use the Tin Plated Steel Ceiling Tiles & Wall Panels for background sets. SKU: SKU00876 Categories: 3" x 3" Design Pattern on 24" x 24" Tile, Aluminum 24x24 Ceiling Tiles, CEILING TILES ALL TYPES, Metal Ceiling Tiles No Discount Apply To These Products Lead Time Estimated 14 to 21 Working Days..
Ceiling Tile, Wall Panels and Cornices are manufactured from Tin-plated steel with a thickness of 0,10″ just like the original sheets and are perfectly suited for use in both Commercial & Residential Applications. Commercially, The Tin Plated Steel Wall Panels & Ceiling Tiles are being used for Drop In Suspended Grid Ceiling Systems, as well as being installed with hammer & nails. Tin Plated Steel Ceiling Tiles and Wall Panels are used in Restaurants, Night Clubs, Retail Stores, Churches as well as on Movie Sets. Our Tin Plated Steel Ceiling Tiles in “Coyote Ugly” and “Spiderman”. More recently in “Jonah Hex” and the more recent “True Grit”. Many TV Shows use also use the Tin Plated Steel Ceiling Tiles & Wall Panels for background sets. Residentially our Tin Plated Steel Wall Panels and Ceiling Tiles can be used in every room, adding elegance to the dining room, fun to a play room and Nostalgia Decor to the entire home, office, restaurant, night club or hotel. 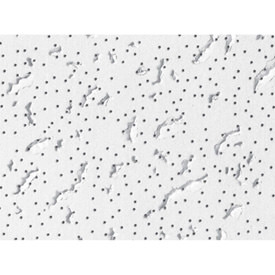 And don’t forget our Tin Plated Steel Ceiling Tiles is a great idea for Kitchen Remodeling. Not only are they perfect for the ceiling but they are a great Kitchen Back Splash Remodeling Idea as well. 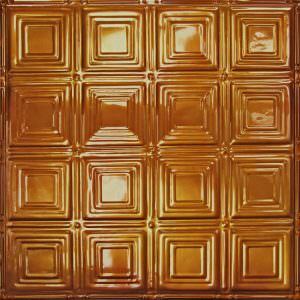 Not only are our Tin Plated Steel Ceiling Tiles a great idea for Kitchen Remodeling and Kitchen Back Splash Remodeling they can be used as Wall Covering or wainscoting or as Wall Panels. Many Customers also use our Tin Plated Ceiling Tiles for Wall Hanging, Picture Frames, Inserts and many arts and craft Do It Your Self (DIY) Projects. Ceiling Tiles and Wall Panels and Cornices are manufactured from Tin-plated steel with a thickness of 0,10 just like the original sheets. The sheets used in the manufacturing process are Tin Plated Steel, not plastic. The shiny tin finish is excellent for paint retention and we recommend painting directly to the metal with an oil-based paint in any room except the bathroom where we recommend using a primer. Some customers want the shiny finish and we recommend for protection of the finish apply urethane or a lacquer (either should be oil based. Some customers protect the metal by painting it silver. The product still has the metallic look, but doesn’t look so new. With the product being manufactured pressed shaped from a steel sheet coated with tin it is recommended a top coating must be applied to prevent corrosion. To maintain the natural metal appearance, a clear polyurethane coating should be applied and basically is needed. Please check with your local Paint Supplier & some customers may want to consider the possible use of Min Wax Fast Drying Clear Polyurethanes or Eastwood Diamond Clear Gloss Finish for Bare Metal. Follow Manufacturers Recommendations & as always Plan & Test before starting a project. 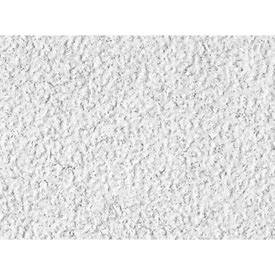 Our Tin Plated Ceiling Tiles and Wall Panels come in a shiny finish and is excellent for paint retention and as stated can be painted in any color with an oil based paint. One is only limited by their imagination so you can paint our Tin Plated Ceiling Tiles and Wall Panels with Oil Based Metallic Paint for a Brilliant Metallic Color such as Copper or Silver. 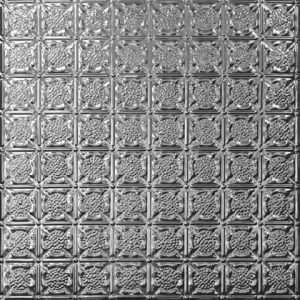 Not all of our Tin Plated Ceiling Tiles and Wall Panels Designs are available in both sizes of 2 feet x 2 feet and 2 feet x 4 feet. For this reason we separate the sizes in our web store for easy selection. With either size installation of our ceiling tiles & wall panels is an easy Do It Your Self Project or hire an Installer to install for you. Many of our designs date back to the early 1800’s and were an alternative to the application of decorative plaster. The concept is bean revived and are becoming more and more popular in the modern world. Please call 888-612-7573. Enjoy your Beautiful Ceiling or Wall Project.